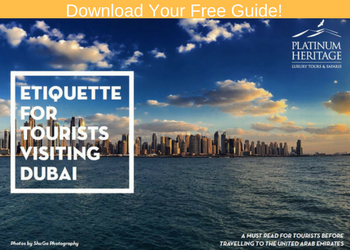 A stark contrast to one of the fastest growing cities in the world, the desert surrounding Dubai is a serene landscape that should be considered a must-see for anyone visiting the UAE. When most people think about a Dubai desert safari, though, their mind instantly goes to dune bashing — a typically short safari that has you packed into a car and that lurches through the desert hills almost recklessly. 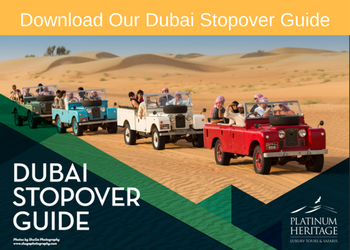 While dune bashing can be a fun experience for the short time it lasts, it has its downsides; it’s typically not family friendly, can feel rushed, but most importantly the sprawling Dubai desert has so much more to offer. With an expansive and rich subculture, exotic wildlife, and some of the most breathtaking scenery in the world, the deserts of Dubai have too much to offer to simply condense it into a 30 minute adrenaline ride that could leave you with more bruises than lasting memories. In addition, the desert ecosystem is very sensitive, about 95% of the animals in the desert live under the desert, so when you drive really fast across dunes you are damaging all the vegetation and wildlife. Dune bashing is not an innocent pastime, it’s an adventure sport and should be limited to certain areas because it does a lot of damage. One of the best ways to discover a new culture and make a connection in a new place is by enjoying an authentic meal. 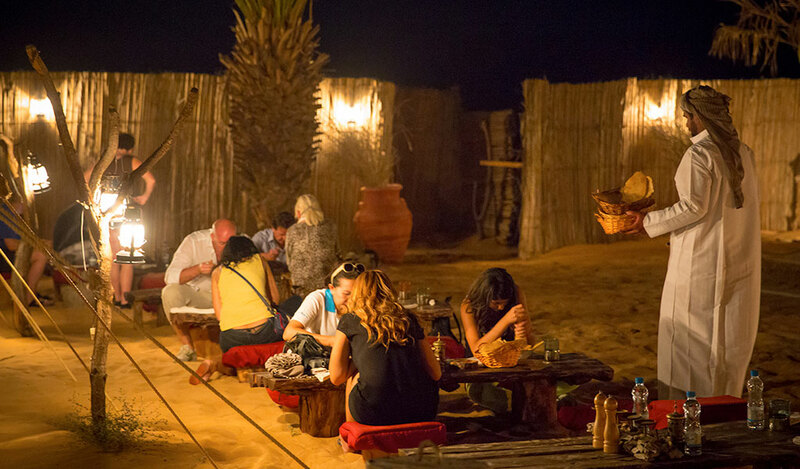 Imagine sitting comfortably on a pillow under the beautiful, unadulterated desert night sky as an expertly crafted Emirati meal is prepared for you, all after taking a leisurely trip through the desert to discover the beauty it has to offer. With a desert dinner safari, that is exactly what you get. There are a few things you should take note of with a dinner safari, though—not all of them are created equally. When booking a dinner safari you need to make sure that you will actually have a fresh, local cuisine prepared if you want an authentic experience and not a forgettable buffet with curries and pasta. Falcons have been an important part of desert life for hundreds of years. The Bedouin, the nomadic peoples of the desert, have forged a special bond with these magnificent birds of prey and utilized their exceptional hunting skills to gather meat needed for survival from the sparse desert environment. 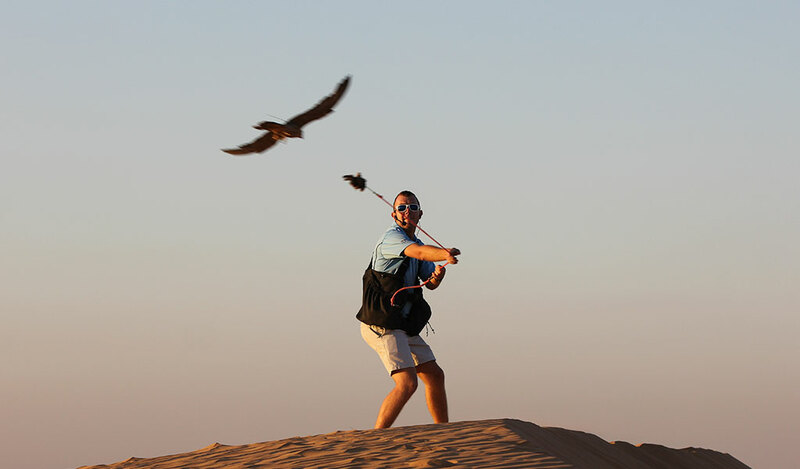 With a falconry safari in Dubai, you will be not only witness first-hand the companionship between a falcon and falconer, but learn about techniques that were used centuries ago and how they compare to falconry today all while in the natural surroundings of the desert. When most think about a wildlife safari, they think about the plains of Africa and not the desert. While the desert is stunning in its own right with its magnificent hills and natural beauty, there is a surprising amount of wildlife that calls the harsh environment home. On a Dubai wildlife safari you will be guided by an expert tour guide to discover some of the rare animals that the barren landscape has to offer including the stunning desert monitors, gazelle, Arabian Oryx or the Arabian (Gordon’s) Wildcat, among other wildlife. 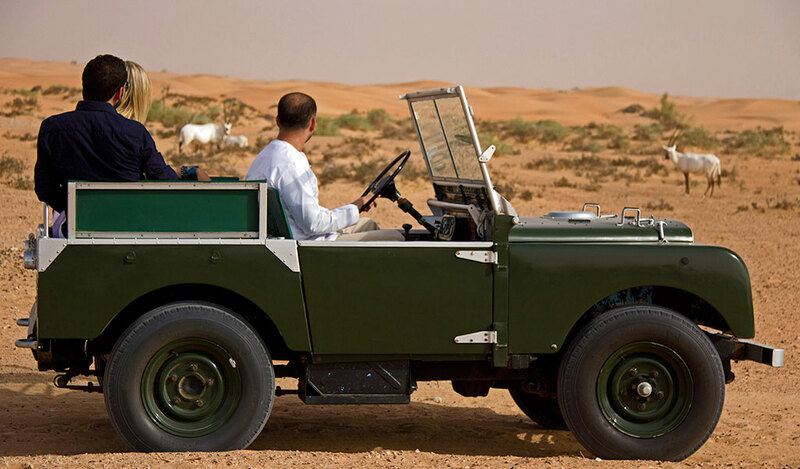 It’s important to note that there are only two tour agencies that are allowed to have wildlife drives in the Dubai Desert Conservation Reserve: Arabian Adventures and Platinum Heritage. In addition to having access to the reserve, Platinum Heritage is the only company that operates on a private desert retreat owned by a Royal Family. Have you ever wanted to discover what traveling through the desert was like before vehicles were brought to the area? A camel safari may be perfect for you. On the back of a camel you will be able to trek through the Dubai desert and experience the landscape in a way that no other transportation method makes possible. A camel safari gives you a unique Dubai desert safari experience that provides a taste of what life was like for Bedouin nomads centuries ago. 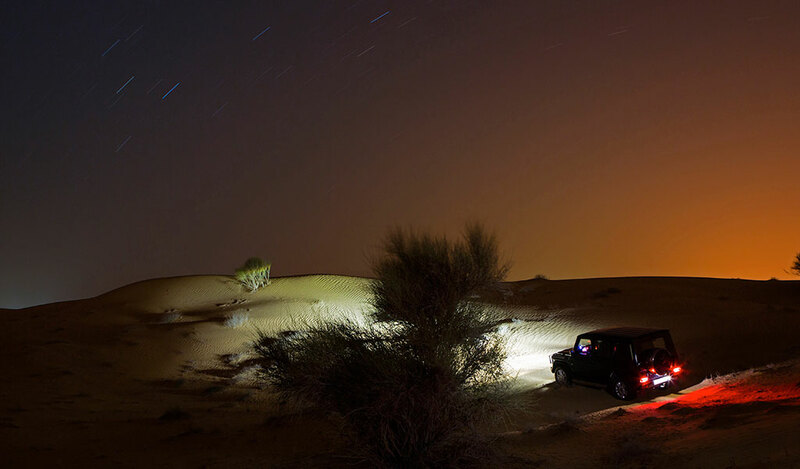 There are two sides to the desert: the hot, sunny experience that you typically think of, and the unforgettable night. As the temperatures begin to cool throughout the desert, nocturnal creatures begin to wander about in search of food and water. With a night safari in the desert you will typically be given high-powered night vision binoculars so you can discover the hidden secrets that the area holds. In addition to the bustling nocturnal wildlife in the area, a night safari in Dubai gives you a chance to enjoy the cool air, a stark contrast to the high daytime temperatures, and gaze at the beautiful stars in a way that you can never experience from a city. Make sure that any night safari tour that you book includes a telescope to make your stargazing more enjoyable. Have a great time in Dubai! 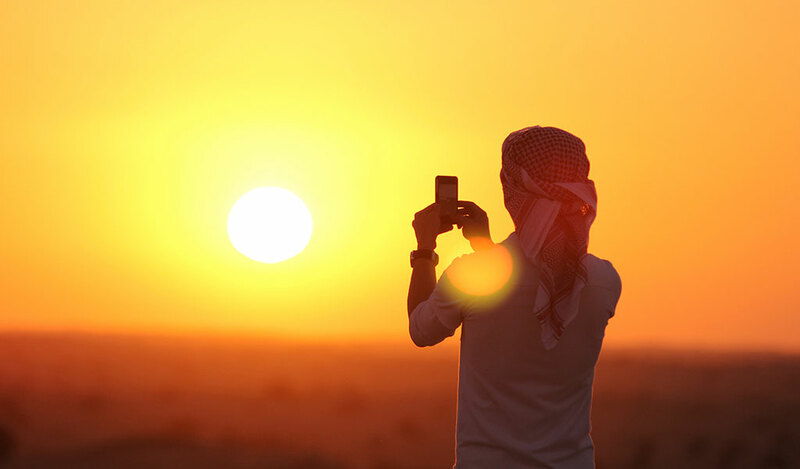 Try to be a responsible tourist and enjoy Dubai desert without dune bashing.